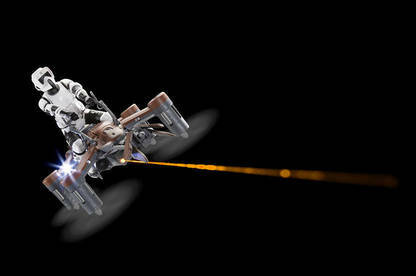 Tiny quadcopters that look like X-wings, TIE fighters and speeder bikes from Star Wars … what could be cooler? Well, what if they shot infrared beams at each other and could have up to 12-person battles? It’s as fun as it sounds. These little “drones” look almost exactly like they do in the movies (although the X-wings’ s-foils are not in attack position). The biggest difference is the downward-facing propellers, which stick out on struts away from the main body for the X-wing and speeder bike, and directly under the body of the TIE fighter. This configuration means the drones have to make a lot of calculations to avoid flipping over (flying is easier if the centre of gravity is below the propellers) and you have to be careful where you land. You need to take off and land from a flat surface or attach the training frame (a black cage that goes around the base and stops the blades from hitting things). It’s also a good idea to use the frame if you’re flying indoors. You pilot the drone with a dual-stick controller, but there is also a companion app. The app acts as a hub for the connected battles, but it also has a training function. You wirelessly connect the app to the controller and then control a virtual drone to get the hang of flying. The app was great for learning the subtleties of controlling the drones, such as how they “slide” in the air after moving rather than coming to an instant stop. The drones tend to drift rather than hover perfectly in place (not replicated in the virtual training), so I had to make lots of fine adjustments with the control sticks to keep it in place. The different drones have their own attributes (for example, the X-wing is the most manoeuvrable, but the speeder bike is the fastest). I found it took a lot of practice learning how to control them, but there are 3 speed settings so I started slow and worked my way up to the “pro” level. The drones are built from a soft plastic that looks rigid. This means the struts and other parts that stick out (like the nose of the speeder bike) bend, rather than snap, when the drone inevitably crashes. The batteries run for roughly 8 minutes but charge back up almost as quickly. The battery has to be removed from drone for charging, which makes the process more difficult than it needs to be. This is especially tough with the speeder bike as the Storm Trooper also needs to be removed first. The drone’s built-in barometer allows for automatic one-button take-offs and landings, which helps avoid bumpy touchdowns. To add to the atmosphere, the controller plays Star Wars sound effects and music (you can plug in headphones if people nearby aren’t as much of a fan as you are). The battles work over a system called LiFi, a form of information transfer using light. To record hits and keep score, the drones send data to each other using infrared beams. You can purchase a physical upgrade that will change the infrared to lasers (you’ll need to install this yourself), meaning you can see the shots if you have a bit of smoke around. In a 6-person battle at the launch event, I found aiming a little difficult as I couldn’t see the other drones from my drone’s perspective, so a scattergun approach was best. Still, it was a lot of fun, especially as we had a group who happily threw Star Wars quotes at each other. 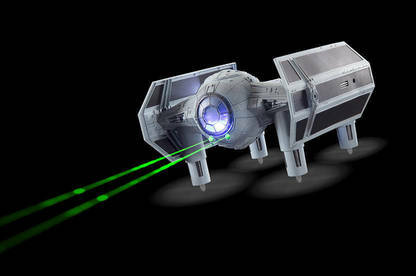 Despite you needing a bit of flight training before taking off, the Star Wars Battle Drones are lots of fun. Sadly, they are a little too small to put an action camera on, so you won’t be capturing chase footage. But you’ll still have loads of excitement blasting around shooting down Rebel scum. The writer travelled to the launch event courtesy of Propel. He was also loaned the drone.